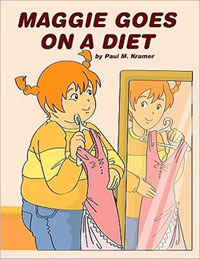 Combating childhood obesity with a diet book for kids? There’s a new children’s book slated for release in September, and it’s aimed at children—presumably overweight girls—ages 6 to 12. According to the Barnes and Noble website, Maggie Goes on a Diet is about "a 14 year old girl who goes on a diet and is transformed from being extremely overweight and insecure to a normal sized girl who becomes the school soccer star." Young girls shouldn't be worrying about diets any more than they should be worrying about mortgage payments. Girls and boys alike should be worrying about evading hot lava monsters and making it across the monkey bars. Then, cheeks flushed after a healthy dose of outdoor play, they should come inside to enjoy nutritious meals provided to them by their schools and families. Instead, all too many children are lounging indoors fiddling with electronic gizmos and suffering from unhealthy eating options at their schools, in their homes, and in their communities. Then we tell them to go on diets. As the childhood obesity epidemic grows, we seem to be turning to adult solutions. If it’s not dieting, it’s organized sports. While potentially a valuable experience for children, in our frenzy to give kids a "workout," organized sports are only becoming more demanding and more extreme. According to the Pikes Peak Courier View, "As many as half of all youth sports injuries are the result of overuse due to an adult-driven regimen of sports play and training so intense that a child’s body rebels." Meanwhile, as Dr. John DiFiori, chief of sports medicine at UCLA, points out, "Children entertaining themselves at their own pace, in their own way, simply do not play sports until it hurts." What it comes down to is this: If you give kids the space and time, they want to run around and play. If you give kids healthy food, they will eat it, even if they grumble about the greens. Placing our adult concerns and expectations on the shoulders of kids won’t solve childhood obesity—and if anything, it will only groom our younger generations to turn into neurotic, overworked adults. Good for Maggie that she lost those extra pounds, but let’s shelve the book and send our 6- to 12-year-old girls outside to play.